We always recommend climbing Kilimanjaro via the Machame route since it has the highest success rate. Machame is a scenic route that starts from the Southern slopes where climbers climb high during the day and descend again before camping for the night. This helps with the much needed acclimatization. You will need at least 8 days for this adventure. The climb itself takes 6 days and 5 nights and we include one day before and after the climb in a comfortable hotel in Arusha. Upon arrival at the Kilimanjaro airport, you will be greeted by our transfer driver and taken to your hotel in Arusha. The rest of the day will be yours to do as you please; you may choose to relax at the hotel or explore the small town of Arusha (a small taxi ride away). 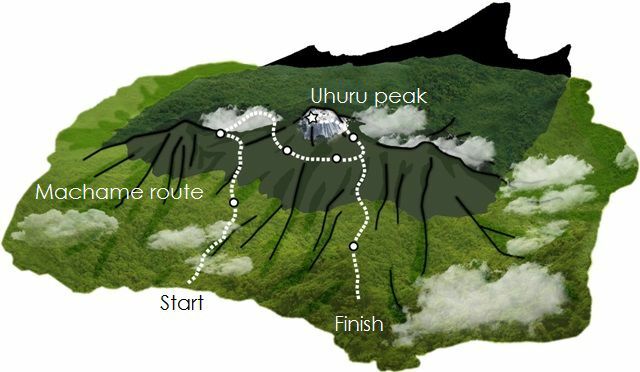 You will have a preliminary talk to help you prepare for your Kilimanjaro climb via the Machame route. After breakfast you will be picked up from your hotel and taken to the entrance to the Kilimanjaro National Park. The drive there takes about 45 minutes. While your guide takes care of the paperwork, you can watch the mountain team preparing for the climb - it is always impressive ‘what’ and ‘how’ everything is carried up the mountain. Once everything is done, your Kilimanjaro adventure via the Machame Route will begin. You will quickly be deep within the magnificent mountain rain forest with ancient trees, primeval ferns, liana, lichen and moss that carpets the ground and drapes from the trees. With a little luck you might get a glimpse and hear the beautiful black and white colobus monkeys in the treetops. After about 5 – 6 hours, you will reach the destination for today – The Machame Camp – which is situated just above the tree line at 3000m. Here, at the base of the Kilimanjaro, you will have your first dinner and overnight stay at the camp. Today you will climb around 700m but you will be camping at an elevation only slightly higher than the previous night. This will allow your body to acclimatise as a height of over 4500m will be reached during the next two days before descending again. The trek begins with a long ascent above the Shira Plateau in the direction of the Lava Tower Hut (4640m). The vegetation becomes sparser as the landscape moves towards an afro-alpine desert. The trek passes through the spacious and sweeping Barranco Valley with its giant senecio and lobelia plants. After 6 – 7 hours, you will arrive at the Barranco Camp. We camp here for the night, enjoying a good evening meal. The trek for today starts with the climb of the “Barranco Wall”. Safety comes first and you will be secured wherever necessary along this route. Following the ridge as it wanders up and down, it offers wonderful views of the south glacier of Kibo. In the Karanga Valley, you will have lunch in preparation for the 2 – 3 hrs climb to Barafu Camp (4640m). Once at camp, you can relax, have dinner and take a short nap in preparation for the early start for the next stage. After breakfast, you can continue with your travel plans or be transferred to Kilimanjaro Airport.